This is a 1932 Zerollo/John Dunhill “Two Pen” Matchstick-fill in Black Chased “Spiral” hard Rubber. Clip imprinted “D.D. Zerollo” Nibs each signed “John Dunhill” who had the marketing license for the English speaking market. There was also a marketing agreement in France with the “Unic” Company. This pen was produced in two sizes, which are equally rare – this is the larger of the two. Features gold filled trim. The cap top unscrews to reveal the matchstick filler. 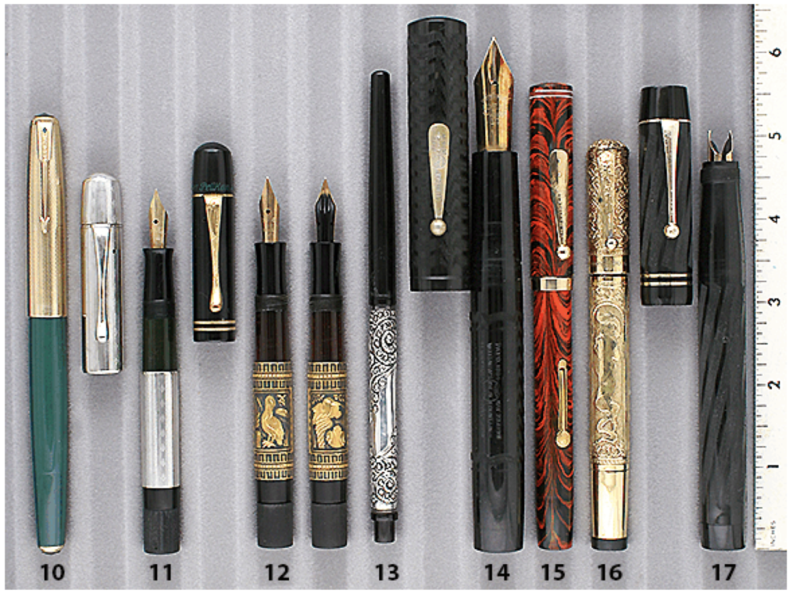 There are two separate reservoirs, one for each of the nibs. Turn the bottom knob to propel one nib, turn in the other direction to propel the other. Medium nibs. Extremely rare! Near mint++. You’ll never find a better example! Item #17 in Catalog #85.